Franklin Matters: FSPA alum returns to coach musical theatre students in "Bring It On"
FSPA alum returns to coach musical theatre students in "Bring It On"
The Franklin School for the Performing Arts (FSPA) Musical Theater Department will present Bring it On The Musical with an all-student cast on Saturday, February 9 and Sunday, February 10 at THE BLACK BOX in downtown Franklin. FSPA student productions are directed, choreographed, and music directed by FSPA’s outstanding faculty, but Bring It On the Musical also required some outside coaching for the cheerleading stunts central to the musical’s plot. FSPA brought in alumna Brooke Collins to work with the students and turn a group of musical theater students into convincing cheerleaders. Brooke Collins, originally from Franklin, grew up studying dancing, singing, and acting at the Franklin School for the Performing Arts. She was featured in FSPA’s senior dance ensemble CenterStage with whom she traveled to Walt Disney World, performed frequently with the Franklin Performing Arts Company, and toured the U.K., France, Italy, Switzerland, and Austria with Electric Youth. In addition to her performance studies at FSPA,Collins was also a cheerleader at her academic school Bishop Feehan. 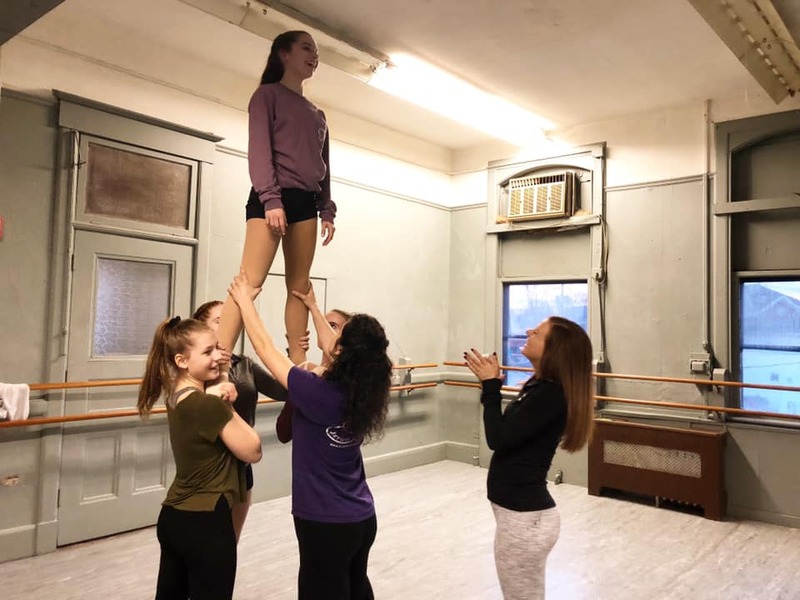 After graduating from FSPA in 2017, Collins was selected to be on Providence College’s elite Dance Team. As a Freshman, she danced with them around the country ending the year at Madison Square Garden. Bitingly relevant, sprinkled with sass, and inspired by the hit film, Bring It On The Musical takes audiences on a high-flying journey that is filled with the complexities of friendship, jealousy, betrayal and forgiveness. Collins has been working with FSPA’s cast on perfecting some lifts and stunts to incorporate in the show about two competing cheerleading teams. Uniting some of the freshest and funniest creative minds on Broadway, Bring It On features an original story by Tony Award winner, Jeff Whitty (Avenue Q), music and lyrics by Tony Award-winning composer, Lin-Manuel Miranda (In the Heights, Hamilton), music by Pulitzer- and Tony Award-winning composer, Tom Kitt (Next to Normal), lyrics by Broadway lyricist, Amanda Green (High Fidelity), and was nominated for the Tony Award for Best Musical. Tickets for Bring It On the Musical are available at www.fspaonline.com or by calling 508-528-8668. FSPA is also offering an “All-Access Pass” to prospective students which includes a free trial class and tickets to an upcoming performance like Bring It On the Musical.